I pray that their friendship and love for one another will last forever. Even with the occasional fist-fight thrown in for good measure. 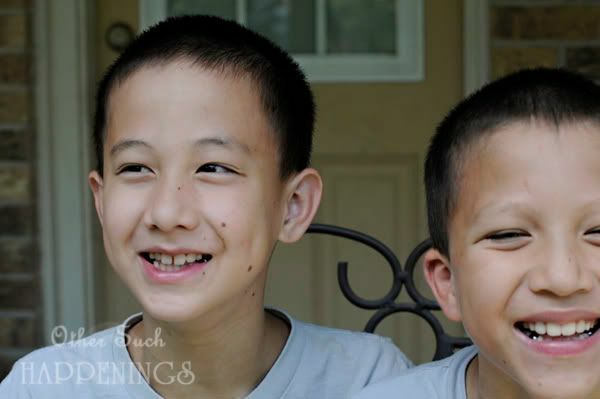 what a sweet moment of two handsome brothers! this brought a big smile to my face! I hope and pray that for my boys:) BFF's! beautiful. Simply beautiful. It's honest and real. Wonderful pictures as usual! I hope my children will always enjoy that special bond between siblings, I wish I had a closer one with more of mine! Beautiful laughter! I just love to catch these kinds of moments between my girls too. Love these pics. 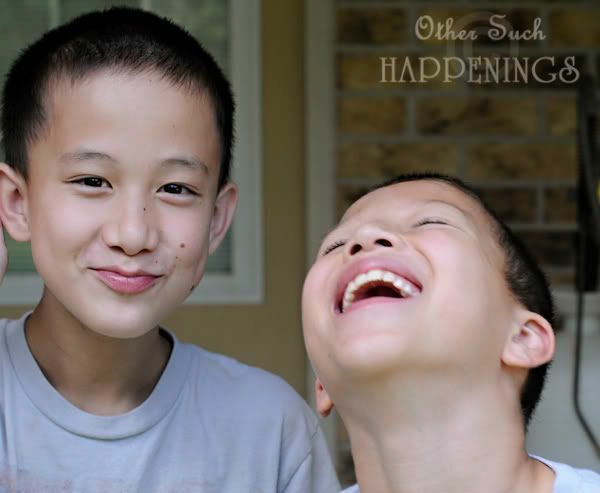 I have 4 boys and love to see them laugh together! Love these pictures. So sweet! Siblings are the greatest (and the worst) aren't they?! Great capture Marsha! Love their joy. Great pictures! I love the real life action shots. I can just hear Noah's laugh through those 2 pictures. I love how Austin is trying to keep it in on that first pic. I can't wait to see them. I love y'all! I'm with Coco--I know exactly how Noah sounds in that picture...and I have no idea how to spell it :) And that look on Austin's face is classic Austin! I love those boys!!! I hope that for my children too, although since I have a girl, it's the teasing they have deal with on occassion. What handsome (and happy) young men! Look just like their mommy too! Great picture :) I found you through the HHH and wanted to come and say hello. You have a wonderful blog, and I am your newest follower. I'll be praying for your family during this difficult time. Oh how precious. I have missed you dear woman. I love this! I have three boys and you instantly made me think of my oldest two. There is definitely an occasional fist fight, but when they're getting along and playing well, they're truly best friends. Woops, I didn't add my name above. Sorry about that! These are my favorite type of photos. Your boys are precious. Brothers do have a special kind of relationship with one another. What a great picture!